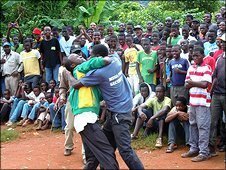 In northern South Africa, men of the Venda tribe continue the centuries-old tradition of musangwe, a form of bare-knuckle boxing that helps young men cope with present-day challenges. A fighter enters the ring and holds his arm out with a clenched fist. He circles the gathered men, waiting for someone to take him on. Soon another man holds out his fist and the fight is on. 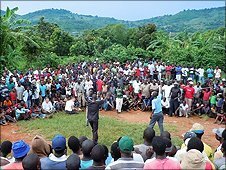 A silence falls over the spectators - all of them are men or boys, women are not allowed near the musangwe ring - as the two opponents circle each other warily. The favourite is Reckson Ralukake, otherwise known as Killer Punch. He is in his 40s and is an experienced boxer who has travelled all the way from Alexandra township near Johannesburg to take on all comers. Opposite him is 18-year-old Nephalama Khobani. He is a much smaller man than the heavily muscled champion. Killer Punch is confident. He crouches down and sticks out his chin and waggles it, tempting his opponent and delighting the crowd who roar with laughter. Suddenly the tension snaps and the two men are hitting wildly at each other. Killer Punch ends up on the ground and Nephalama raises his hands to be acclaimed as the victor. In this ancient place called Chifude set between green rolling hills, the fights continue for days under the hot African sun. The next contest is over in seconds, a swinging straight-arm punch to the eye socket results in a stream of blood pouring out over the fighter's face. The brawl is stopped and the injured man is rushed to the nearby Lundevhe river to wash off the blood. "I am worried about his eye," one of the older men says, as he follows the humiliated loser. There are only three rules to musangwe boxing. The struggles continue until blood is shed, or someone is knocked out, or one of the fighters raises his hand to signal surrender. Musangwe boxing has been practised in this same beautiful valley for centuries. Originally it was a way of teaching men to be warriors and selecting the bravest to fight for the tribe - and the custom has never died. "Some people see it as barbaric," says chief organiser and once-invincible champion "Poison" Ndavana, "but it is our culture. For us it is like karate for the Japanese." Poison is now too old to fight but he is a central figure in keeping this ancient tradition alive. "We are not fighting for any rewards," he explains. "There is no money that changes hands. Musangwe makes your heart strong." He gestures at the patch of green grass where the men gather in a ring and watch the fights. "This is a sacred place. The blood of our forefathers and their teeth have all fallen here. My grandfather was a fighter here in 1939 and then my father, and then I started in the 1970s. "The name Poison has been passed down from them. When I was fighting, I fought for my clan and my ancestors." He smiles wryly. "I cannot let my name go down." 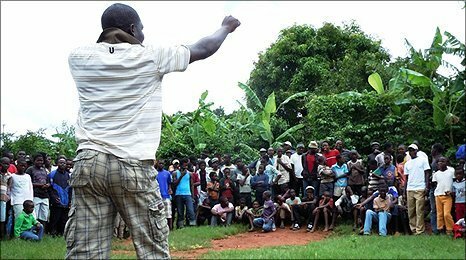 Musangwe today is seen as a way of teaching men to be brave and to stand fast in a time of joblessness and economic hardship. "There is so much crime these days," Poison explains. "Fighting here keeps the young men away from crime. It also teaches them not to beat their women. They must be men to fight other men." The matches start at an early age. The youngest category the "mambibi" consists of nine-to-12-year-olds, teens belong to the "rova" group and the over 18s are known as "ngwenya", or crocodiles. Those aged 35-45 are "seniors" and the few boxers over 45 are honoured with the name of "legends". The Lundevhe river is the boundary between rival groups. Those who live north of it always fight the southerners. Shumane Mashige is a 23-year-old who comes from the north. His homestead is a 45-minute walk away through maize fields and groves of mango trees. He has no job and lives in a cluster of huts on a rocky hillside with his parents and grandmother, Phophi Mashige. "We are proud of him for being a fighter," she says. "We have always had fighters in our family. I don't worry about him. I know he will be strong." Musangwe is the highlight of Shumane's year. He jogs to the river where he washes his hands in the traditional ritual, and then joins the crowd at Chifude. He stretches his fist out eagerly and is met by Khomola Mulalo. The fight does not go well for Shumane. After a few punches and a scrappy clinch, he ends up defeated and raises his hand in surrender. He is sweating and bruised but not bleeding. "I'll fight again today," he says. He watches ruefully as the victor is carried out of the ring. "Anyway," he adds, "he is my friend. I can't feel bad that he beat me."